Size of this preview: 800 × 511 pixels. Other resolutions: 320 × 204 pixels | 640 × 409 pixels | 1,024 × 654 pixels | 1,280 × 818 pixels | 4,608 × 2,943 pixels. 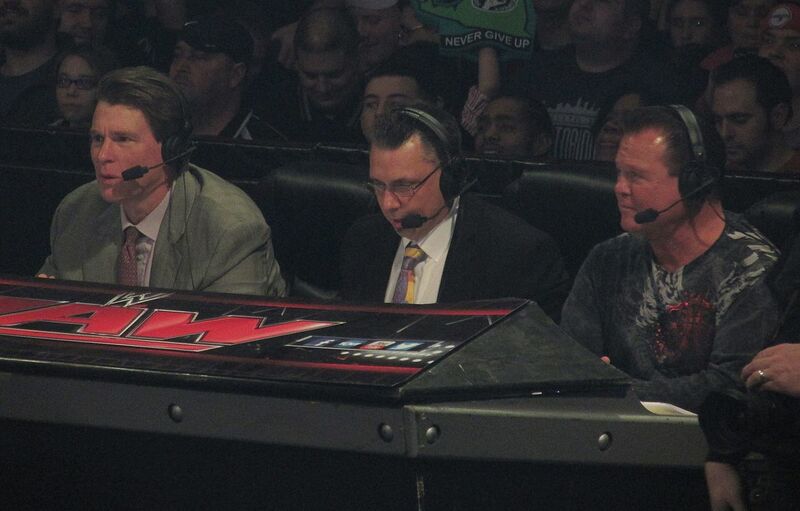 John "Bradshaw" Layfield, Michael Cole and Jerry "The King" Lawler commentating at ringside at Raw on January 27, 2014. This image was originally posted to Flickr by LUNIZ_GOT_5_ON_IT at https://www.flickr.com/photos/34415742@N07/12196020036. It was reviewed on 1 April 2015 by FlickreviewR and was confirmed to be licensed under the terms of the cc-by-sa-2.0.